The period of near ecstasy over the electoral victory by partisans of Panama's new elected President, Juan Carlos Varela (who was inaugurated this past July 1) is rapidly coming to an end. After jubilant partisans celebrated his victory Varela declared to his supporters "today democracy won, today Panama won, we will not tolerate corruption in any way," in addition to guarantees of a more transparent government, growth of social programs and less inequality. What started out as enchantment with the new president has evolved into skepticism. This relates to the change Varela promised his audiences during his presidential campaign. Varela clearly was not former president Ricardo Martinelli's (2009-2014) chosen successor. In fact, Varela worked diligently towards the end of his term as Martinelli's vice president to distance himself from the former president's most fundamental positioning. Since 2011, when Varela resisted Martinelli's attempts to extract greater executive power from the legislative and judicial branches, the two have been called the worst of enemies by the country's media. Yet, the similarities between these two individuals are too numerous to ignore, as they are analogous not only in their belief systems but also in their backgrounds. Much of the media have noted that in terms of their politics, both men are center-right, members of Panama's elite, and originally come from the business sector. Even the natures of their personal businesses are connected: Varela's liquors are sold in Martinelli's Super 99 supermarkets. "the more than 70,000 hectares of arable land taken out of production in the Martinelli years and the social turmoil in rural Panama are huge issues and Varela's promise to give every rural household running water and indoor plumbing may have been unrealistic or may be the public works program that saves rural society from total dissolution." Hence, it comes as little surprise that Panamanians have a hopeful outlook for what may come, but are by no means certain that it will actually help. Panama has enjoyed an enviable rate of economic growth under Martinelli, as the country's building boom has made the capital "a new Miami" or the "mini-Dubai on the Pacific" Panama City also lays claim to Central America's first metro and Latin America's tallest building. The country's building boom, in addition to his ability to carry out economic projects with both panache and a rare rate of success made him a very popular president. Yet his authoritarian streak generated considerable resentment in a large Panamanian populace who want to forget the country's history of dictatorship, particularly under the Manuel Noriega regime in the 1980s. Accusations of corruption had routinely plagued the former Panamanian administration, and many from the country had good reason to believe that Martinelli's economic program was not at all that it was originally made out to be. It is hard to ignore the stark difference between the glitz of Panama City and the grim living conditions to be encountered in almost every other locale in Panama. The nearby region of Colon provides a ready contrast that should illustrate this point. This can be seen in the festering environment that describes the vast area that vividly contrasts with the economic growth described above. The World Bank notes that Panama is responsible for providing evidence some of the severest disparities of wealth in Latin America. Obviously not all of Panama is "booming" with wealth. Most notably is the fact that last month was the Panama Canal's 100th anniversary. What was supposed to be a joyous and memorable moment for the country was tainted by huge over run costs, strikes, and the fear of competition. Looming on the horizon are plans, backed by a Chinese billionaire, to build 173-mile canal to be built across Nicaragua. For Nicaragua this is good news and "the government says it is critical to lifting the nation out of dire poverty," to Panama it is direct competition that could drain away profits in addition to being an instigator for future country generated debt if the government chooses to attempt to out build the Nicaraguan project. The Panama Canal, which was built in 1914 and was returned to Panama near the end of the Cater administration, has significantly boosted Panama's economy, in addition to promoting global international trade and effectively reducing transportation costs. The canal is currently being renovated to allow changes that will reduce transit delays and allow larger trans-isthmus voyages to travel through the locks. Ironically the construction that is supposed to reduce delays in the future, has managed to produce them today. In February, there was a work stoppage due to a dispute between the canal administration and contractors working on the Canal expansion project that involved a $1.6 billion USD in additional cost overrun regarding the planned construction. Moreover, in May, a strike of 5,000 laborers slowed work again. Due to these occurrences the October completion date has been pushed back 14 months. Juan Zamorano of the Durango Herald writes about the benefits that was suppose to accompany canal renovations, "its completion was envisioned as a coming out party for Panama, a chance to showcase the country's pro-business credentials and role as a linchpin of global commerce…backers portrayed the vote as a bet on the future of Panama's children". However, now many disenchanted Panamanians are now seeing the problems besetting the Canal expansion as a metaphor for the future course of the country. With the country at the mid-expansion stage, giddy hopes clearly have been dashed and more somber sentiments have evolved that will now have to be replaced. The country as a whole will not be able to generate or sustain the economic expansion symbolized by the Panama City construction boom and the opportunities provided by the Canal Zone. 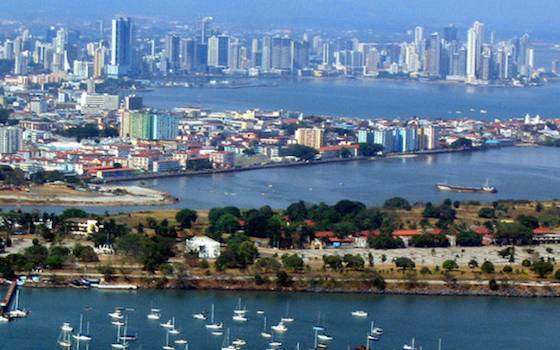 Panama had a tremendous 8.5% economic growth in 2013 , well above most developed and developing countries, yet over 25% of the population remains at or below the poverty level. These figures are reflective of the concentration of wealth in Panama's urban centers, which like many other Latin American countries have become national show cases in the shadows of what lies as stark economic disparity. Like it's Latin American sister countries, the challenge in Panama remains in defining economic and social policies which will enable the economy and population's abilities to move toward a more balanced profile. Part of this definition is recognition of the government's responsibility to its "social contract" with the population. In this respect, Varela's 100 por 70 plan may be a step in the right direction. However, the "fuel" that will support this and other social programs must come from the economy itself; simple redistribution of wealth via taxation or other means without expanding the populations and by extension the country's potential productive capacity ignores the valuable potential of the Panamanian people. "The First 100 Days" is a term coined during the Roosevelt Administration during the 1930's when his New Deal attempted to bring the economy out of deep depression. Since that time, the first 100 days has been period after which the national populations and the world have taken a close look at countries' leaders in order to determine in what direction the country might move. President Varela is just beyond his first hundred days in office and as noted, there are some positive indications for the future. It remains to be seen whether Varela's social justice platform will be sufficiently robust to counter balance-anticipated fallout from possible economic policy setbacks. "The Challenges of Panama's President Varela"